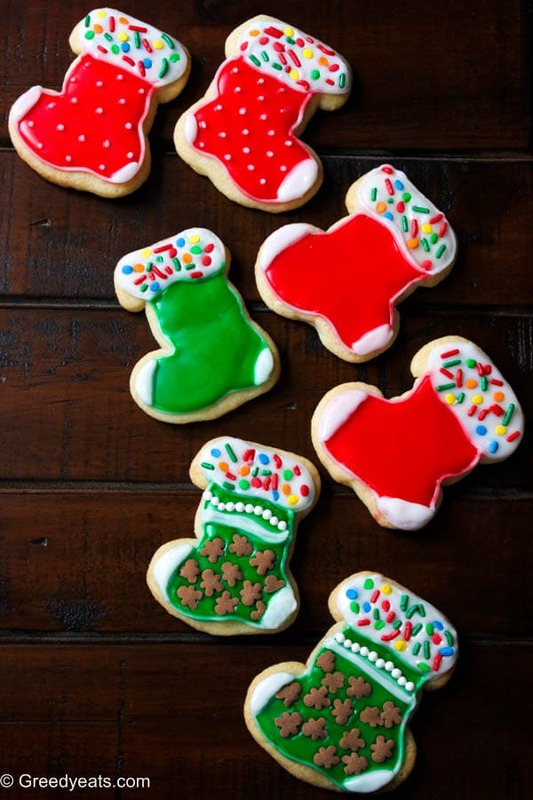 My small batch sugar cookies decorated as stocking cookies are sure to steal the show. These are topped with a super easy sugar cookie icing! Now who doesn’t know sugar cookies? 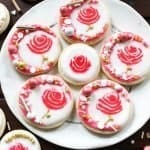 Or hasn’t seen those pretty sugar cookie decorating videos all around the internet? Then what’s so unique about today’s post? Wait, Do I ask way too many questions? Well ask that to Pranay! But seriously, does the world even need another sugar cookie recipe? Are you asking me? Mmmm.. I’d say YES! You remember those stale left over sugar cookies on your plate after Christmas? Sugar cookies topped with teeth breaking icing on the top. All sad and dead coz they weren’t picked up! Well, today I am here to save you that leftover cookies trouble!!! We are baking a small batch sugar cookies recipe that will make around 9 large cookies. No more dying cookies on your plate. You are welcome! These are unbelievably chewy (not dry at all!) with slightly crispy edges. My sugar cookies bake up all puffy but have gorgeous flat tops (if this makes any sense). Isn’t a cutout sugar cookie a winner if it doesn’t spread too much and hold their designs well. Above all this homemade sugar cookie recipe makes the MOST flavorful and the MOST buttery cookies. And a hint of almond extract in the batter takes them all the way to the top! Studded with all those crunchy sprinkles to add festivity and a nice texture contrast. You know what I am going to say. And I know what you are thinking! Easy??? Let me spill the beans cutting all the crap! This icing uses no meringue powder. 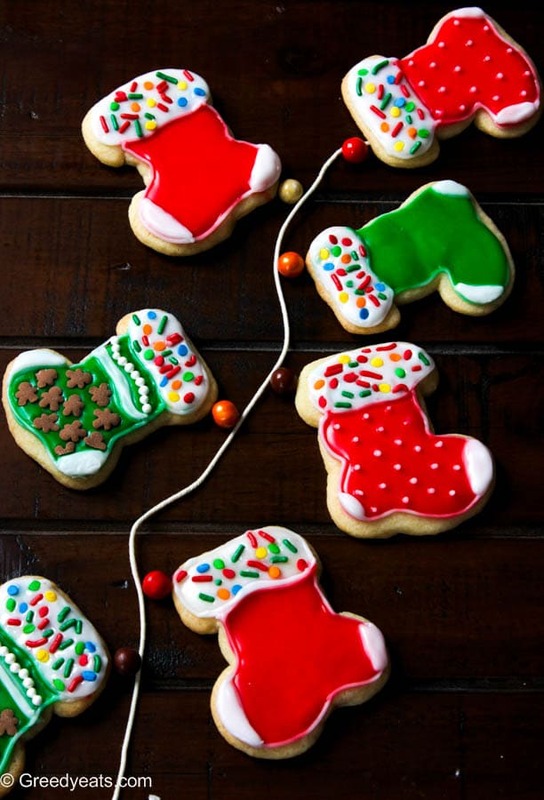 So it won’t dry too fast while you are decorating your cookies, but it definitely dries hard. It doesn’t taste shugary, all diabetic and boring. Thanks to the addition of almond extract here! You can thicken the icing by adding more confectioners’ sugar if you find it too thin and can thin it out using water (small amount at a time) when find it too thick. All the power to you! You can store the icing covering tightly at room temperature for good 2-4 hours. Uses gel colors for that bright red and green stocking color. Measuring the flour correctly is crucial to this cookie’s success. Too much flour and the dough will have a hard time coming together. 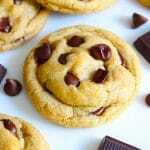 Too less and you will have greasy, flat and crumbly cookies! Bake same sizes together and take extra care not to over bake these. As sharp edges will darken way sooner than the blunt ones. I like to lift my cutout cookies using metallic spatula in one hand and supporting the cookie with my other one. makes things super easy. If you want your cookies to bake thin and crispy, roll your disc to 1/8 of an inch and bake them till the edges get a light golden color. on the contrary, if you like your cookies to be thick and soft, roll them thick. About 1/4 to 3/8 of an inch. Bake them only till you start seeing a very pale golden color on the edges. 1. Beat butter and sugar together on high speed, using a hand held mixer until light and creamy. About 2 minutes. 2. Beat in egg, vanilla and almond extract. Beat on high speed to combine until everything is incorporated well. 3. Now add baking powder and half of the flour and mix on low. Add the remaining flour and mix till a dough is formed. 4. Roll out the dough on a floured surface (no need to chill the dough) till it is about 1/4 to 3/8" and cut into desired shapes with cookie cutter. 5. 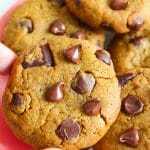 Bake the cookies for about 6-8 minutes in a preheated oven at 350 deg F. Don't get close to any of the heating elements. And keep an eye on them, you do not want to over bake these sugar cookies. 1. Mix corn syrup, almond extract and water as needed to confectioners' sugar and mix it well. Add water slowly and as needed to make the icing thick but pipeable. 2. Add gel colors as needed. You will need two additional bowls. One for red and the other for green colored icing. 3. 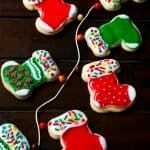 Transfer the icing to a piping bag and using round icing tip#5, outline the cookies and then frost as desired. 4. Top with sprinkles (optional, but pretty) while the icing is still wet. Iced and plain cookies stay fresh, covered tightly in an air tight container for about a week. These cookies can be stacked after the icing dries hard, which may take upto 24 hours, depending on the consistency of your icing. ©GREEDY EATS. The content and images on greedyeats are copyright protected. Please do not use/republish my images, content or recipes without my prior permission. When sharing, you can always link back to this post for recipe. So very festive and beautiful! 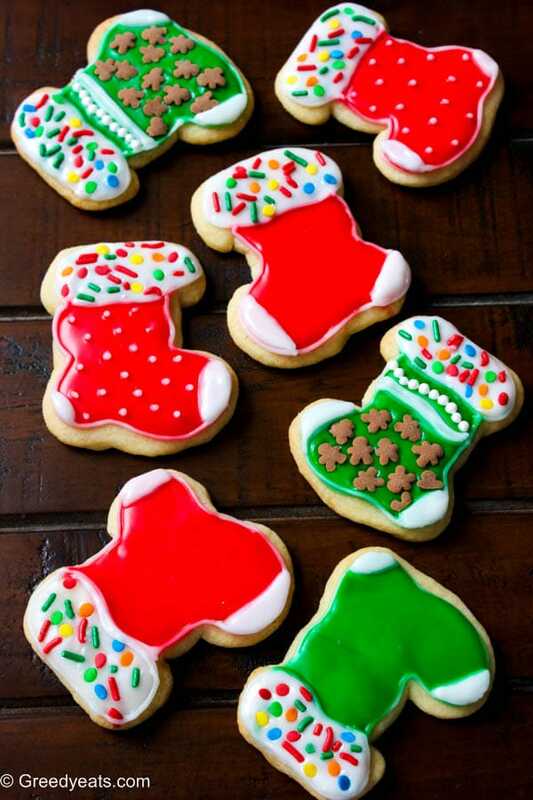 Neha, these cookies are ADORABLE! I totally love the addition of almond flavoring, I think it completely elevates the cookie. Thanks also for the tips! Looks good. Your times are off in the description, though. Thanks for pointing that out Terah, just corrected! Thank you for this lovely work ! Pinning ! Thank you for the icing recipe! I feel like that’s always what I mess up on. This definitely seems like something i could do following your steps. The cookies with ice seem to me more and more good, always more beautiful and exquisite! Do it very well! 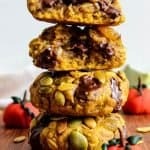 wow, these cookies look amazing, I wonder if I can use gluten free flour. Do you think they’ll turn out as good? You sold me the minute you said they are soft. 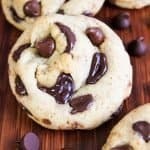 I love soft cookies and these look incredible. I love cookies and I wish I know how to bake. I’ll save your recipe and will share it to my Mother. I like this recipe as it has only small batch, my kids want it but I don’t make as it has to make in bulk. Now I have this recipe, I will try this. 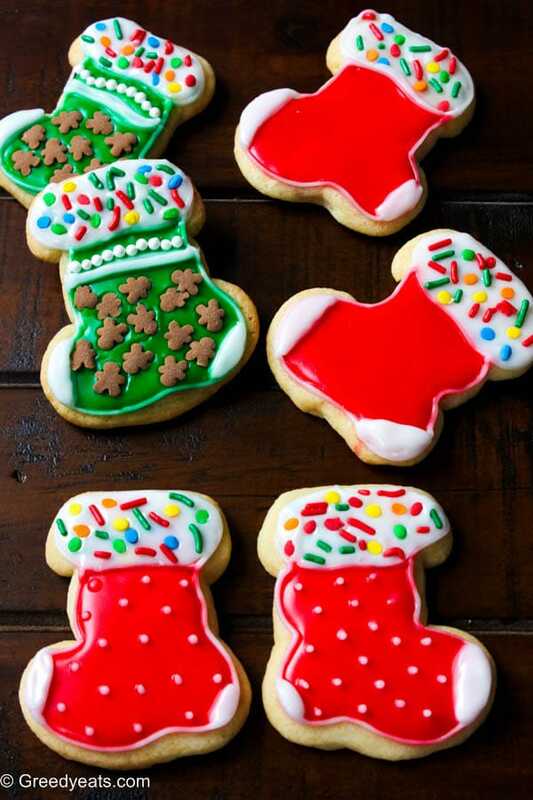 Beautiful cookies.